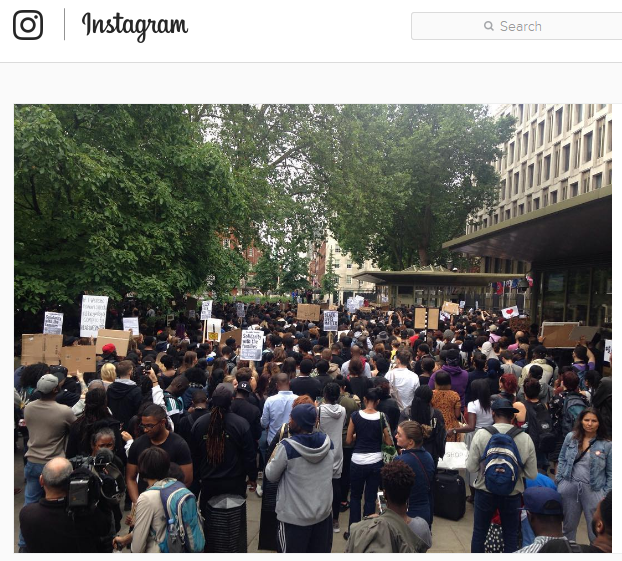 On the evening of Friday 8th July, the day after the Black Lives Matter march in Dallas, large crowds began to form on the Southbank, before proceeding to march through the busy streets of Central London, in the very first of many Black Lives Matter marches to take place in London. The black lives matter demonstrations in the US were launched as a result of numerous horrific killings of black men and women in the US at the hands of US police, whom are apparently there to protect and serve. This shocking reality, although less documented, is also aparent in the UK for those that care to take an interest and needs to stop, collectively, crimes that can only be described as despicable, soulless and sickening displays of police brutality, stereotyping and 100% racism against black people as a race. In the UK Mark Duggan was shot and killed by police in Tottenham, North London, England when police were apparently 'attempting to arrest Duggan on suspicion of planning an attack' with absolutely no grounds to take his life. The most visually shocking, well documented murders at the hands of US police which prompted the recent marches were that of Alton Sterling, shot dead in Louisiana while on the ground, already under police restraint (as seen in a shocking video leaked to the public) and Philando Castile, the very next day in Minnesota, shot dead in front of his girlfriend and her 4 year old daughter in his car. Both cases were filmed in part or full and went viral for all to see, with the aftermath of Philando Castille's murder being filmed LIVE on Facebook by his girlfriend who was in the car at the time; bringing forth a sickening and stomach wrenching visual reality check (to people of all races) about what black men and women have to face, based merely on the color of their skin ONLY and regardless of having a clean record, a good occupation,and a good heart (Philando Castille worked as a Nutrition Services Assistant for kids at Chelsea Heights Elementary School and Arlington High School and had no previous record) - didn't make a damn bit of difference to how he was treated, nor did clearly stating that he had a licensed firearm before reaching for his identification which he was asked for (having a licensed fire arm is legal in the USA and those who have one and are being stopped and searched are to always declare this immediately to the officer which he is said to have done, he was still shot and killed). So why protests? We wanted to catch up with the little lady who actually arranged the first protest in London (almost accidentally)? and find out the motive behind the movement. After stumbling across a few tweets from females inspired by 18 year old Capres Willow Turner, who arranged the Southbank March we decided to get her in and pick her brain on behalf of the world! (You can thank us in the comment section below - enjoy the interview)! Crystal: So Capres! We heard that you were the little lady behind the #BlackLivesMatter march! Shutting down Central London and inspiring many, young and old, with your post march speech! Impressive indeed at just 18 years of age! You said you expected "30, 40, 50 people to turn up" and the end result.... around 3,000 wasn't it?! So how and very importantly WHY did you set this up? Capres: Yes, it was incredible! I set the protest up because of the obvious inequalities within society. The videos I saw on Twitter of the recent killings in the USA, showing police brutality were just the tipping point. I wondered why London had not stood up and showed that they cared. London is such a diverse city and I know that many Black Londoners experience, I'm afraid to say on a fairly regular basis racism. I had to do something! Crystal: Not only did you organised this but you also spoke out to the crowd on the day using a mega phone saying things like "its up to us, were the youth, we are the next generation" and "so just remember, you yourself, you are powerful...you're so powerful"
How did you feel in that moment when you were speaking out to the crowd and what was your main goal and message that you wanted these people at the protest to walk away with that day? Capres: Speaking to the crowd was completely spontaneous. I knew I would, at some point have to address the crowd but I was nervous as I had never even attended a protest before! I felt extremely overwhelmed as I didn't expect the turn out and at that early stage in the protest, already 6/700 people had turned up. I was blown away. I felt it was important to let people know that I am just like them and therefore they can make a change, just like I hope to one day do. All I (did) was make a smart decision to stand up for what I believe in. Crystal: You also talked about 'balance' in your speech with regards to the media and said "the media plays such a large part in our lives, look were all here today because of social media... We've got to use it to our advantage like today'. How do you think black people can use social media to our advantage, what would you suggest to people that are reading this post? Capres: I suggest using social media to promote yourself in the best light possible, whether you're a writer, an aspiring chef, a dancer or maybe just enjoy fitness. Network and connect. See who has similar interests as you and promote each other! The media, like many things in this world, is a blessing and a curse all in one, and it is up to you to use it wisely! 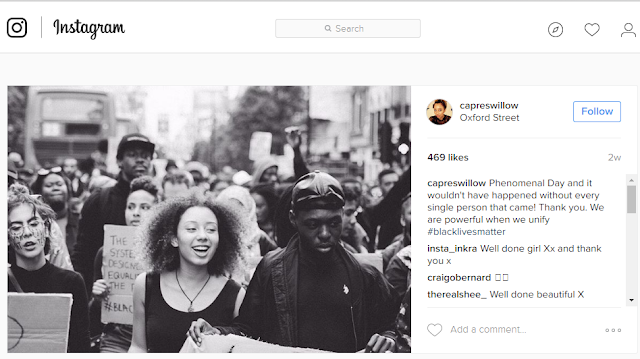 Crystal: Now many people that we have come across in the last few weeks, while the #BlackLivesMatter campaign has been running strong, have been quite split in their opinions about the benefits of #BlackLivesMatter protests. Many have even suggested that they resemble 'complaining in the streets' to 'nobody listening' and that we should instead be searching for and working on a solution. As someone who has organised and participated in such a march, you got a certain feeling from the event saying"The power, the energy, I can feel it" so alongside this feeling, what benefits do you feel can be found in marching in this way for the things that you believe in? Capres: Marching for me is a new thing. I had never attended a protest before but felt so compelled just to get some real attention on the matter. It is all good and well watching someone being MURDERED on Twitter, complaining and then going back to your regular life, but by organising something such as a protest, not only are you able to shout and scream to the skies above, but you can gain media attention, meet like minded people and then band together with your new found connections to start making changes. Protests are one of the small steps that we need to take to show the rest of the world that we care and we are not afraid to stand up. Crystal: Well said with regards to connecting with like-minded people and banding together to make a positive change, we are all for that and we certainly look forward to seeing what comes next. So more about you, we know that you write a travel blog? So tell us more about it! Capres: Ooo, yes my beloved blog! I started it earlier this year as I felt I needed a new hobby to keep me busy. I named it 'Willow's Wanderlust' as my middle name is Willow and I adore travelling and adventure. I love visiting new places, seeking out thrills and experiencing a whole different culture. It is fairly new and I feel I have neglected it slightly due to being overly busy! I hope to sit down soon and revamp it... giving it a bit of an update and adding my Copenhagen series into the mix, as well as other bits n bobs to keep readers busy. Crystal: Great and you just completed your A-Levels too right? Well done! So what did you study and what would you like to do next? Thank you. I studied English Literature, Drama and Theatre Studies and Sociology. My fav had to be Sociology because my teacher was brilliant. At my secondary school I was taught to accept society for what it was rather than question the obvious flaws and once in college doing A Levels, I was able to spread my wings and become the inquisitive person I am. What next is a tricky decision. I have applied to study Social Anthropology at uni and am still deciding if I want to go this year or take gap year to have a longer think. Hmmmm... Decisions! Crystal: Decisions, decision, we've all been there! Just follow your heart and listen to your thoughts - you already know the answer deep down and it will come to you just in time! I think within and beyond the protest that you recently launched, you are a great inspiration to women everywhere for having a voice and speaking up for their beliefs. You turned your thoughts and feelings about the brutal imagery you witnessed into a 3,000 strong march just from making an effort and taking the initiative to speak out about it. What advise do you have for other women (and men) out there who have something to speak out about but are too scared or worried to do so? My advice for other women that may be worried or concerned is; take a leap of faith! If you really believe in what you are standing up for, you can't fail. The moment you stand up and show that you give a s*?t, is the moment you win. It is as simple as that. Whether 3000 or 30 people had turned up to my march, I would have still stood up for what I believe in and that's what counts right? Silence is as good as siding with the oppressor. There is nothing more amazing than a strong woman, and we all have it in us!! !